Roofers don’t measure roofs in square footage. A roofer measures a roof by the “square”. So what is a roofing square? A roofing square is 100 square feet, which is the equivalent to 10′ by 10′. You cannot simply get the measurements of your roof by the measurements of your home because the pitch of the roof needs to be taken into consideration. Just because you have a 2000 square foot house doesn’t mean your roof would be 20 squares. You will need a professional licensed roofer to measure your roof. This is extremely important when it comes to ordering to right amount of materials. There are many factors that can affect the cost of your new roof. Obviously one of the main factors are the types of roofing materials you choose to use. Other factors are whether or not there is a preexisting roof which will require hours of labor to strip off. Many homes in Florida have multiple roofing systems installed on top of each other which will only increase the labor hours to tear off the old roof also increasing the cost. Once a roof is stripped the roofing contractor you hire may find that there are structural repairs that need to be made. Almost every re-roof on an existing home requires some level for wood work. Another factor that will affect the costs of a new roof is the shape of the roof and obstacles such as chimneys, vents, valleys, hips, ridges, crickets etc. Some roofs are simple while other roofs are cut-up therefore requiring more time and materials to install a new roof. Not all types of roofing materials can be used on all type of roofs. For example, you would not want to install asphalt shingles on a flat roof. Also, roofing materials such as slate and concrete are extremely heavy and the structure that the roof is being installed on may not be able to support such weight. You will need to speak with a professional roofing contractor to discuss which type of roofing system would be best for your home. Consider the following options with speaking with your roofing contractor. 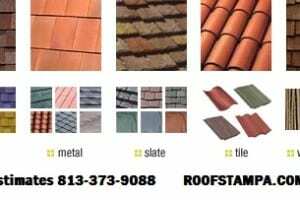 Asphalt Shingles – Asphalt shingles are the most commonly used roofing material in Tampa Florida, and the rest of the country for that matter. This is because they are the least expensive and because they are the easiest to install. Asphalt shingles are made of a fiberglass medium mixed with asphalt and a granular surface for added protection and most importantly to make the shingle aesthetically pleasing. There are options among asphalt shingles. You could choose the most basic standard 3-tab single layer shingles, multi-layer dimensional shingles, or designer shingles. The standard 3-tab shingles cost less but they only have a life expectancy of around 15 years versus 25 years for dimensional shingles. Wood – For centuries wooden shingles were the main choice. In some areas wooden shingles are still a choice but they have been forbidden in many areas due to fire codes. Wooden shingles are usually made of cedar, redwood, or southern pine. Wooden shingles have a life expectancy of about 25 years just as asphalt shingles do however wooden shingle roofs cost almost twice as much. Metal – Aluminum, copper, steel, and lead are all durable types of roofs; however, they are also very expensive. Lead and copper-asphalt are usually installed as shingles while other metal roofs are installed as seemed vertical panels of metal that are joined by solders. Metal roofs are much more expensive than asphalt shingle roofs but they also have their benefits. Tile and Cement – Spanish tile roofs are very popular in Tampa and all other areas of South Florida. Cement and some metal also imitate the Spanish tile look. Tile and cement roofs can be very heavy and very expensive however they are also expected to have very long lives. Slate – Slate is among the most durable of roofing materials. The slate itself often outlives the fasteners that hold them into place. In fact the slate is often reused and expected to last another century. Slate roofs can be 15 times more expensive that an asphalt shingle roof therefore they are not very common. The existing roof or the types of roofs in your neighborhood will most likely determine the type of roof you choose to have installed on your home. If you decide to go with other options you will need to consider the color, weight, cost, and durability of the type of roof that you think is your best fit. If you are not a roofing expert then you will need the help of a professional roofing contractor or roofing consultant. Homeowners Associations – Many homes in Tampa Florida, and the rest of the country for that matter are in deed restricted communities governed by a Homeowners Association which require or restrict certain types of roofs and colors. Before having a roof installed be sure to check with the board or directors in the community you live in. Installation – It doesn’t matter what type of materials are used for your new roof if they are not installed correctly. Your roof is the most important part of your home as it is exposed to harsh weather, especially in Tampa Florida. A poorly installed roof can cause structural damage as water can damage the frame and interior causing rotton wood, mold, and much more. Be sure that the Tampa roofing contractor you hire is experienced, professional, has a long list of references, offers a legitimate warranty, and will be around in the future to make any necessary repairs. If you would like to schedule a FREE ESTIMATE with us please fill out our free estimate form of give us a call.